I have sold a property at 467 QUEENSLAND CI SE in Calgary. I have sold a property at 23 ELGIN ESTATES HL SE in Calgary. Welcome to one the most sought-after locations in Elgin Estates, pie lot backing onto Elgin Hill & just steps to Inverness pond pathway. Perfect blend of traditional finishings with modern luxury, over 3800 sq ft of living space spanning 3 levels with developed walkout basement. This home has been meticulously maintained with updates including engineered hardwood floors, stainless appliances, carpeting & custom butler’s pantry. Entertain in your chef’s kitchen featuring white shaker cabinetry, contemporary lighting, granite counters & induction range. Step out of the kitchen to a private patio with awning & lovely views of the green space. Upstairs the master retreat is sure to impress with luxurious ensuite complete with his/hers sinks, soaker tub & double shower. A huge bonus room with built in cabinetry, 2 bedrooms with walk in closets, laundry & main bath complete the upper level. The walk out basement has a family room centered on a cozy gas fireplace, wet bar, guest bedroom & full bath... Professionally landscaped sunny backyard with mature trees, terraced stone work & sprinkler system. The upgrades are endless including slate front entrance, stucco exterior, aggregate driveway, air conditioning, 2 gas lines, oversize 23x27 garage with floor drain. Truly one of Mckenzie Towne’s best properties! I have listed a new property at 13923 PARKLAND BV SE in Calgary. Renovated family home on a large lot in sought after Parkland! Steps away to both great schools. As you enter you are greeted with an enormous living room & dining space. The kitchen shines with custom cabinetry, granite counters & stainless steel appliances. Tons of natural light flows through the south facing windows overlooking the huge backyard. The family room centers on a cozy gas fireplace & has sliding door access to the yard. Engineered hardwood floors flow throughout the main level. A main floor office or guest room/4th bedroom, laundry & powder room round out the main level. Upstairs you will find 3 bedrooms including the generous master with fully renovated ensuite bath & plenty of closet space. Lower level is fully finished with a rec room, play space, office & a bathroom with limestone tile & decadent bath to soak. You will love the huge backyard filled with mature trees. Double attached garage with room for 4 more vehicles on the driveway. Additional updates incl 2 HE furnaces & roof. I have listed a new property at 7 PRESTWICK LN SE in Calgary. NO CONDO FEES! Terrific value in this Mckenzie Towne charmer! 3 bedroom, 3 bath family home in a community built on small town appeal. The main floor is flooded with natural light and you’ll love the large south facing deck off the kitchen, perfect for lounging, dining and entertaining. The backyard sings in the summer with greenery and warmth. Upstairs you’ll find a good sized master bedroom with walk in closet, full bathroom and 2 additional bedrooms. The basement is all set for family movie nights, can you smell the popcorn?! Complete with a full bathroom this space can be used as a theatre room or guest/teenager space. Walking distance to 2 schools & steps to Prestwick water park. Walk to all the amenities offered on High Street. Don’t miss this gem at a great price! I have listed a new property at 23 ELGIN ESTATES HL SE in Calgary. I have sold a property at 141 SUNWOOD PL SE in Calgary. This one is all about the location! Quiet family friendly cul-de-sac steps from elementary & middle schools, you can watch them walk to school from the back window & no roads to cross! Inside this home is the perfect blend of modern & traditional. Stunning main floor & basement Albi Renova renovation complete with a main floor addition to enlarge the kitchen. Sleek Brazilian Cherry hardwood flows throughout the main level. Main floor office is a good size. Custom kitchen cabinetry topped with gorgeous granite counters. You’ll love the wall ovens & oversized island. Cozy family room off the kitchen centers on a stone surrounded fireplace & modern built-in cabinets. The basement is incredible with large theater room & the projection TV stays. The gas fireplace makes it perfectly cozy & the additional bedroom & full bath mean you're set for guests, teenager or nanny.Professionally landscaped backyard is an oasis of trees & greenery with in ground sprinklers. Please see additional remarks... New maintenance free deck is perfect for lounging & grilling. Kitchen renovation and dining addition 2012. Other updates include soffit and eaves trough, furnace 5 years ago, new windows, garage door, shingles 8 years ago. Wonderfully maintained family home in Lake Sundance. I have sold a property at 39 INVERNESS BV SE in Calgary. Charming 4-bedroom family home on a beautiful tree lined street in the Village of Inverness. Hardwood floors flow from the spacious front entrance through to the kitchen & dining area. The kitchen features gas range, breakfast island and corner pantry. At the heart of the home is large, bright, living room with brand new carpet, and newly refaced fireplace with built-ins. Completing the main floor is the powder room and large mudroom/laundry area. The new carpet carries through to the upstairs bedrooms. The master bedroom features his & hers walk-in closets, plus a 4pc ensuite. 2 more large bedrooms, with their own walk-in closets & guest bath complete the second level. Fully developed basement is freshly painted featuring recreation room, bedroom (with egress window), hobby space & 3-piece bath with granite counters. Mature landscaping, double detached garage. Enjoy morning coffee on the large front porch. Walking distance to High Street amenities, playgrounds and Mckenzie Highlands School. Great family community. Quick possession. I have listed a new property at 141 SUNWOOD PL SE in Calgary. I have sold a property at 50 ROYAL OAK HT NW in Calgary. Welcome to this lovely 3 bedroom, 2.5 bath home in Cascades of Royal Oak. Natural light floods the spacious main level with hardwood throughout. Freshly painted, the open concept main floor features functional kitchen with raised breakfast bar for those on the run meals, dining nook overlooking the backyard & spacious living space with corner fireplace. The dining room or flex space is great for more formal entertaining or office area. Powder room and laundry complete the main floor. Hardwood floors are carried through upstairs to the bright, spacious bonus room. The master bedroom features a large walk in closet, 4 piece ensuite with double shower and soaker tub. 2 more bedrooms and guest bath complete the second level. Outside you will find deck with new railing & large yard with mature trees & landscape. Walking distance to Royal Oak Park, playgrounds & Junior High School. Great location close to 3 new schools (K-12), transit, Royal Oak outdoor hockey rink & the new YMCA Rec Centre. I have sold a property at 292 SUNDOWN WY SE in Calgary. Best value in Lake Sundance! Lovely 5 bedroom family home in Sundance. Vaulted ceilings and gleaming hardwood greets you in the living room as you arrive. The family room centers on a cozy brick wood burning fireplace perfect for chilly fall evenings. The kitchen has dark rich cabinetry and a large island, perfect for entertaining. There is also a good sized flex room on the main level that can be used as formal dining or an office space. Laundry is also found on the main floor. New carpets flow throughout the upper level of this home. The large master bedroom is complete with sitting area and spacious ensuite. The basement is fully finished with 2 more bedrooms, a full bath and generous rec space. You will love the big backyard with concrete patio, fully fenced in vinyl and RV parking too. Upgrades to the home include roof, many windows and garage door. Sundance is a terrific family friendly neighborhood with all levels of schools and the lake for year round fun! I have listed a new property at 39 INVERNESS BV SE in Calgary. I have listed a new property at 135 CRANLEIGH VW SE in Calgary. Welcome to this stunning estate home with RIDGE VIEWS & just steps to the Bow River pathway. This home sits in one of the most prestigious locations in Cranston, nestled into a quite cul-de-sac. A stately entrance with gorgeous Brazilian cherry wood floors carrying throughout the home. The beautiful kitchen features espresso cabinets, granite countertops, double wall oven, gas range and a built in Miele coffee station. Just off the kitchen, head out to the patio to enjoy a bbq & ravine views. A private office, powder room & laundry room complete the main floor. Upstairs the master offers a luxurious en-suite with jacuzzi tub, steam shower & a dream walk in closet with its own washer/dryer and fridge! The bonus room is a great place to hang out and enjoy the mountain views. An additional bedroom & full bath complete the upstairs. The walkout basement offers the ultimate in entertainment with full bar with beverage center, dishwasher, ice maker & large family room perfect for movie nights. Two large bedrooms & full bath complete the basement.Main floor windows feature custom California shutters.Large private yard with low maintenance decking & hot tub.Triple car garage with oversized aggregate driveway can easily fit 4 cars. Close to South Calgary hospital, YMCA, shopping & schools. I have sold a property at 3232 15 ST NW in Calgary. Heaps of character in this Collingwood home! Just the second owner of this mid-century, charming 4-bedroom home. On the lower level you will find a spacious, updated kitchen with butcher block countertops, subway tile & pot lighting. Newer bamboo flooring carries through the open concept kitchen, living & dining areas. The kitchen leads out to a west facing patio area, perfect for entertaining. Included on this floor is den/office, laundry & utility area & 3-piece bath. Upstairs is oozing with rustic charm. At the heart of the home is a large family room with original hardwood floors, authentic reclaimed barnwood from Saskatchewan on a feature wall, vaulted ceiling with exposed beams centering on a wood burning fireplace. In addition, you’ll find 4 bedrooms & 5-pc bathroom. Tiered landscaping, mature trees enhance the curb appeal. Enjoy multiple patio areas & double detached garage. Updates include: central air conditioning, hot water tank, 2 furnaces, appliances, windows & doors. INVESTORS TAKE NOTE!! Centrally located, minutes to downtown, steps to Confederation park, quick access to U of C and SAIT. Unique home, unique opportunity! Staged to sell in Airdrie !! This Airdrie home had been listed with another Realtor with no luck snagging a buyer. I knew instantly when I walked in that I could stage this home to draw people in. The big pieces were there but it needed some spice and softness. 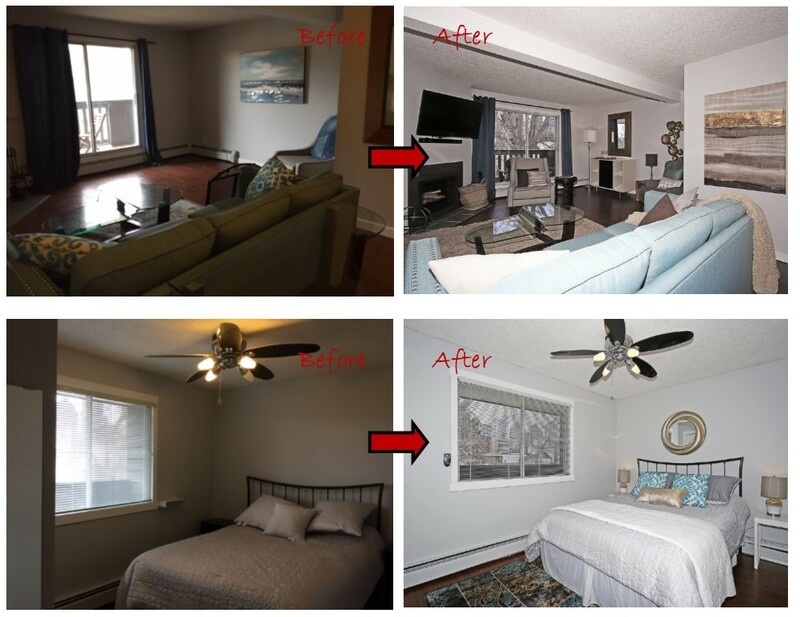 Also, when a home has been on the market for some time already you need to shake things up with a fresh start and that means a new look and new photos! 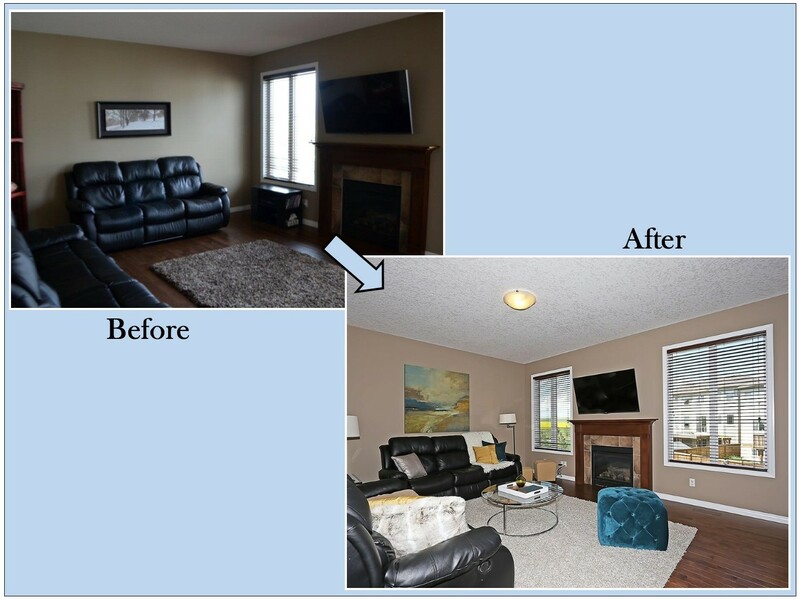 You don’t want buyers and Realtors to see the same old photos and pass it by thinking they have already crossed that one off the list. At that point the only tool in the box is a price reduction to make it happen. We brought in a rug, some art and pillows to pop in some colour. I remember showing it to a couple of buyers who said, “I think we were in this one before but it looks so different – better!” You know when they settle in on the couch to talk about what they like about the home there’s a good chance you’ve got a sale. I have listed a new property at 292 SUNDOWN WY SE in Calgary. Lovely 5 bedroom family home in Sundance. Vaulted ceilings and gleaming hardwood greets you in the living room as you arrive. The family room centers on a cozy brick wood burning fireplace perfect for chilly fall evenings. The kitchen has dark rich cabinetry and a large island, perfect for entertaining. There is also a good sized flex room on the main level that can be used as formal dining or an office space. Laundry is also found on the main floor. New carpets flow throughout the upper level of this home. The large master bedroom is complete with sitting area and spacious ensuite. The basement is fully finished with 2 more bedrooms, a full bath and generous rec space. You will love the big backyard with concrete patio, fully fenced in vinyl and RV parking too. Upgrades to the home include roof, many windows and garage door. Sundance is a terrific family friendly neighborhood with all levels of schools and the lake for year round fun! Renovated family home in sought after Parkland. As you enter you are greeted with an enormous living room & dining space. The kitchen shines with custom cabinetry, granite counters & stainless steel appliances. Tons of natural light flows through the south facing windows overlooking the huge backyard. The family room centers on a cozy gas fireplace & has sliding door access to the yard. Engineered hardwood floors flow throughout the main level. A main floor office or guest room/4th bedroom, laundry & powder room round out the main level. Upstairs you will find 3 bedrooms including the generous master with fully renovated ensuite bath & plenty of closet space. The lower level is fully finished with a rec room, play space, office & a bathroom with limestone tile & decadent bath to soak. The huge backyard has room for everything to play, entertain & lounge & you will love the mature trees. Double attached garage with room for 4 more vehicles on the driveway. Additional updates incl 2 HE furnaces & roof. Just steps away from both of Parkland’s fantastic schools. Nothing to do but move in & enjoy! I have listed a new property at 3232 15 ST NW in Calgary. I have listed a new property at 50 ROYAL OAK HT NW in Calgary.